Please be aware of the restriction. In fact this also means you need to be aware of values set by the lower configuration layers (including defaults) to properly override/modify those. The spy.properties configuration file can be located in various places. The following locations are searched to locate the file. Please note that all the properties are exposed via JMX. So you can use your tool of choice (e.g.,JConsole) to view/change them. Moreover reload operation is exposed as well. To provide on-demand reload option. # A comma separated list of JDBC drivers to load and register. # sets the date format using Java's SimpleDateFormat routine. # if exposing options via jmx (see option: jmx), what should be the prefix used? #whether the binary values (passed to DB or retrieved ones) should be logged with placeholder: [binary] or not. # Execution threshold applies to the standard logging of P6Spy. # have exceeded some high water mark. # This time is reloadable. modulelist holds the list of p6spy modules activated. A module contains a group of functionality. If none are specified only core p6spy framework will be activated (no logging,…). Still once reload of the properties happen, or these are set by JMX, modules would be dynamically loaded/unloaded. com.p6spy.engine.outage.P6OutageFactory - for outage functionality. Please note to implement custom module have a look at the implementation of the any of the existing ones. This is a comma separated list of JDBC driver classes to load and register with DriverManager. You should list the classname(s) of the JDBC driver(s) that you want to proxy with P6Spy if any of the following conditions are met. You are using a JNDI Data Source - Some application servers will prevent the automatic registration feature from working. For standard development, set the autoflush value to true. When set to true, every time a statement is intercepted, it is immediately written to the log file. In some cases, however, instant feedback on every statement is not a requirement. In those cases, the system performs slightly faster with autoflush set to false. If stacktrace is set, the log prints out the stack trace for each SQL statement logged. Limits the stack traces printed to those that contain the value set in stacktraceclass. For example, specifying stacktraceclass=com.mycompany.myclass limits the printing of stack traces to the specified class value. The stack trace is converted to a String and string.indexOf(stacktraceclass) is performed. If reloadproperties is set to true, the property file is reloaded every n seconds, where n is defined by the value set by reloadpropertiesinterval. For example, if reloadproperties=true and reloadpropertiesinterval=10, the system checks the File.lastModified() property of the property file every 10 seconds, and if the file has been modified, it will be reloaded. If you set append=true, the log will be suddenly truncated when you change your properties. This is because using reloadproperties is intended to be the equivalent of restarting your application server. Restarting your application server truncates your log file. reloadproperties will not reload any driver information (such as realdriver, realdriver2, and realdriver3) and will not change the modules that are in memory. Appenders allow you to specify where and how log information is output. Appenders are a flexible architecture allowing anyone to write their own output class for P6Spy. To use an appender, specify the classname of the appender to use. The current release comes with three options which are slf4j, stdout, and logging to a file (default). Please note, that all of these output in the CSV format (where separator is: “|”). p6spy-<version>-logback-nodep.jar - having logback included. For further instructions on configuring SLF4J, see the SLF4J documentation. The log message format is selected by specifying the class to use to format the log messages. The following classes are available with P6Spy. com.p6spy.engine.spy.appender.CustomLineFormat, which allows log messages to be full customized, in a separate property called customLogMessageFormat. See below for details. execution time - the time it takes in milliseconds for a particular method to execute. (This is not the total cost for the SQL statement.) For example, a statement SELECT * FROM MYTABLE WHERE THISCOL = ? might be executed as a prepared statement, in which the .execute() function will be measured. This is recorded as the statement category. Further, as you call .next() on the ResultSet, each .next() call is recorded in the result category. The com.p6spy.engine.spy.appender.MultiLineFormat might be better from a readability perspective. Because it will place the effective SQL statement on a separate line. However, the SingleLineFormat might be better if you have a need to parse the log messages. The default is com.p6spy.engine.spy.appender.SingleLineFormat for backward compatibility. You can also supply your own log message formatter to customize the format. Simply create a class which implements the com.p6spy.engine.spy.appender.MessageFormattingStrategy interface and place it on the classpath. P6Spy allows you to filter SQL queries by specific strings to be present (includes property value) or not present (excludes property value). As a precondition, setting filter=true has to be provided. P6Spy will perform string matching on each statement to determine if it should be written to the log file. include accepts a comma-delimited list of expressions which is required to appear in a statement before it can appear in the log. exclude accepts a comma-delimited list to exclude. Exclusion overrides inclusion, so that a statement matching both an include string and an exclude string is excluded. If your expression matches the SQL string, it is logged. If the expression does not match, it is not logged. Please note you can use sqlexpression together with include/exclude, where both would be evaluated. info includes driver startup information and property file information. debug is only intended for use when you cannot get your driver to work properly, because it writes everything. statement includes Statements, PreparedStatements, and CallableStatements. batch includes calls made to the addBatch() JDBC API. commit includes calls made to the commit() JDBC API. rollback includes calls made to the rollback() JDBC API. outage includes outage related information. result includes statements generated by ResultSet. resultset includes values retrieve from the ResultSet. Enter a comma-delimited list of categories to exclude from your log file. 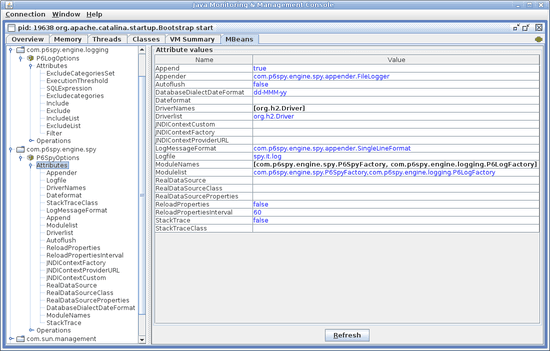 See filter, include, exclude for more details on how this process works. whether the binary values (passed to DB or retrieved ones) should be logged with placeholder: [binary] or not. This feature detects long-running statements that may be indicative of a database outage problem. When enabled, it logs any statement that surpasses the configurable time boundary during its execution. No other statements are logged except the long-running statements. The interval property is the boundary time set in seconds. For example, if set to 2, any statement requiring at least 2 seconds is logged. The same statement will continue to be logged for as long as it executes. So, if the interval is set to 2 and a query takes 11 seconds, it is logged 5 times (at the 2, 4, 6, 8, 10-second intervals). If set to true, the execution time will be measured in nanoseconds as opposed to milliseconds.